Resource center How Addictive Is Ativan (Lorazepam)? 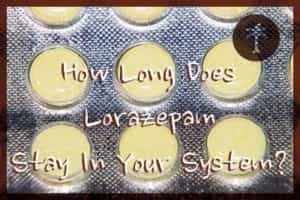 How Long Does Lorazepam Stay in Your System? Lorazepam is the generic name for a benzodiazepine medication sold under the brand name Ativan. This medication is prescribed to treat anxiety, including anxiety associated with depression and panic disorders. It is sometimes prescribed to treat irritable bowel syndrome (IBS), nausea and vomiting associated with cancer treatments, insomnia, epilepsy and seizure disorders, and withdrawal symptoms from alcohol. Ativan was approved for prescription use in 1977, and the generic version was approved in 1985. As a prescription drug, lorazepam can be taken as an oral tablet, a liquid solution consumed orally, and a liquid injection. Sometimes, in emergency situations, lorazepam injections are given to treat prolonged epileptic seizures or psychosis. Like other benzodiazepines, lorazepam can be abused. This class of drugs acts on the gamma-aminobutyric acid (GABA) receptors in the brain, just like alcohol does. This makes lorazepam and other benzodiazepines useful when managing alcohol withdrawal symptoms, but it also creates a similar relaxed euphoria. People who struggle with alcohol use disorder (AUD) or who are at risk for substance abuse are more likely to develop an addiction to benzodiazepines. Lorazepam is a fast-acting benzodiazepine, so it quickly takes effect; the effects also quickly stop, and the drug is metabolized out of the body. Lorazepam is intended for short-term or as-needed use. The body quickly develops a dependence on this drug, and the manufacturer’s warning label states that it should not be taken for more than four months without a doctor’s very close supervision. When struggling with lorazepam abuse, it is important to get help from medical professionals to safely detox. During detox, it is helpful to understand how long lorazepam stays in the body as this affects how long withdrawal symptoms may last. Tablet and orally ingested liquid versions become active in the bloodstream after moving through the digestive system. Some of the drug is absorbed through the stomach lining, but most of a dose of lorazepam is absorbed in the small intestine. This takes between 15 and 30 minutes; peak effects hit the brain within two hours and then begin to taper off. However, the drug has active metabolizes in the blood for 12-24 hours. Half of the drug is excreted during the first 12 hours after ingestion. Misusing medication can lead to intoxication, dependence, and addiction. Liquid injections of lorazepam are designed to enter the bloodstream and bind to the GABA receptors in the brain much faster. They may be eliminated from the body much faster, but injections are only used in hospital settings. These elimination times are based on specific medical doses of 0.5 mg to 1 mg. Taking more than that without the oversight of a physician is misuse of the drug. During detox, the body will experience symptoms from lorazepam for 2.75 days on average. This average is affected by how long addiction to lorazepam lasted – months versus years, for example – and how much of the drug was consumed. The elimination half-life is averaged to 15.7 hours to 3.59 days. In comparison, long-acting benzodiazepines, like Valium (diazepam), can take up to 30 days (one month) to be mostly eliminated from the body. The amount of time needed for the body to fully metabolize the drug out depends on how it is taken. Even though lorazepam is a short-acting benzodiazepine, it remains in the body for a relatively long time. The half-life for lorazepam is generally estimated to be about 12 hours; however, some metabolites may remain detectable by some drug tests for over 18 hours. Most drug tests determine that short-acting benzodiazepines like lorazepam can be detected in a window of about 24 hours; however, different drug tests will detect lorazepam after different amounts of time. Blood tests: Lorazepam is detectable in the blood within six hours after ingestion, for up for three days afterward. However, these tests are rarely used to determine if Ativan has been abused because urine tests are more reliable for longer. Urine tests: A metabolite called lorazepam glucuronide will remain detectable by urine tests for 4.13 days. It takes between five and six “half-lives” for lorazepam to be fully metabolized out of the body. Urine tests can detect lorazepam for between one and six weeks, depending on the size of the dose. Saliva tests: For most drugs, saliva tests are less reliable, unless the person has just consumed an intoxicating substance. Ativan is detectable in saliva for about eight hours after ingestion. Hair tests: Drugs are detectable in strands of hair for months, even after a person stops taking them; additionally, where the drug is found on the hair strand can determine how long ago the individual took the drug. Lorazepam is detectable in hair for four weeks (one month) after exposure.